JOIN US Today for Fresh Content on Various Dating Sites, Offers and Categories. Your privacy and email address are save with us! 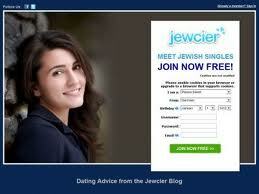 JEWCIER – Jewcier dating site was launched in 2010 for Jewish singles. Most members live in the United States and Israel. It’s is a friendly new singles site where Jewish women and men can become acquainted with one another, whether that be for friendship or for romance. Member profiles on the site are comprehensive and detailed and include details such as religious level, temple attendance kosher food, and the type of relationship sought. You can send email and instant messages as well as chat with your friends in chat rooms. This site allows you to send anonymous messages, too, in case you’re interested in some flirting. You won’t find any adult content on the site, or people looking for casual affairs. Most of Jewcier’s members are looking for long term relationships. The site is fairly new, but is gaining membership quickly. This exciting new alternative to traditional Jewish matchmaking offers a laid-back, friendly atmosphere for any Jewish single seeking a companion. FREE REGISTRATION RESIDENTS: US Only. GET FREE JEWCIER MEMBERSHIP NOW!